The bolded line is key, explaining why Amazon’s acquisitions have shaken markets – the Whole Foods acquisition prompted a $12 billion drop in grocery shares and the PillPack acquisition triggered a $15 billion dollar pharmaceutical share drop. Consumer retail may have taken the first hit, but customer expectations are upping the ante in every vertical. Not even B2B is spared from these changing expectations (which is why we at Freightos launched an online freight marketplace). Freight industry executives likely sighed with relief when an update of Amazon’s logistics.amazon.com page on June 28th turned out to be nothing more than a franchise model for courier delivery services. But last month’s announcement was a stay of execution, not a reprieve, and it’s only a matter of time before Amazon reveals plans for a comprehensive logistics network. Amazon is at the nexus of ecommerce, data, and logistics, with a drive to constantly improve their logistics network. According to their 2017 annual report, over a quarter of Amazon’s third-party sales (which represent half of Amazon’s sales) are cross-border. Cross border fulfillment and global logistics are increasingly goals in and of themselves. Their early 2018 competition assessment noted that “companies that provide fulfillment and logistics services for themselves” are competition. In other words, if you’re shipping your own goods, you’re competition. At over 243.5 million square feet, if all of Amazon’s distribution and fulfillment space were laid out side by side, it would spread across a quarter of Manhattan. 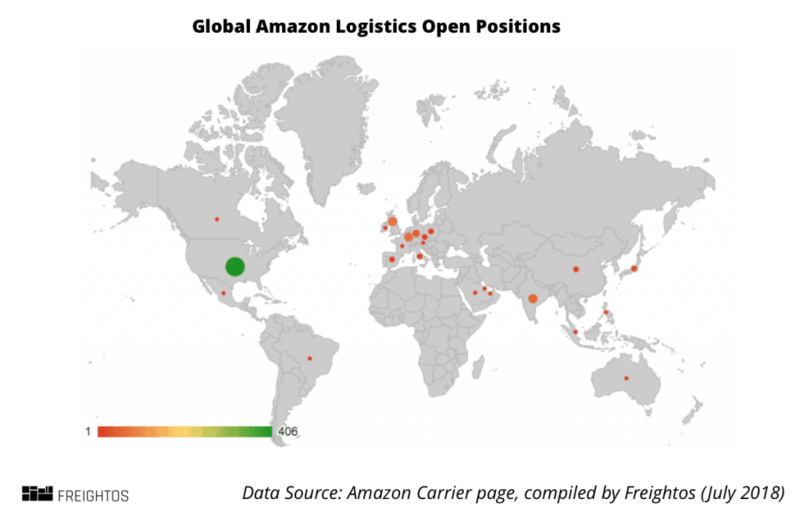 That’s 258 operational facilities in the US and another 486 distributed around the world (see map below, data from MWPVL). In the US, this sprawling network is defined by a range of different services, from Prime Now hubs near urban centers to fresh food and Whole Food delivery goods, and, of course, fulfillment, sortation and delivery stations. 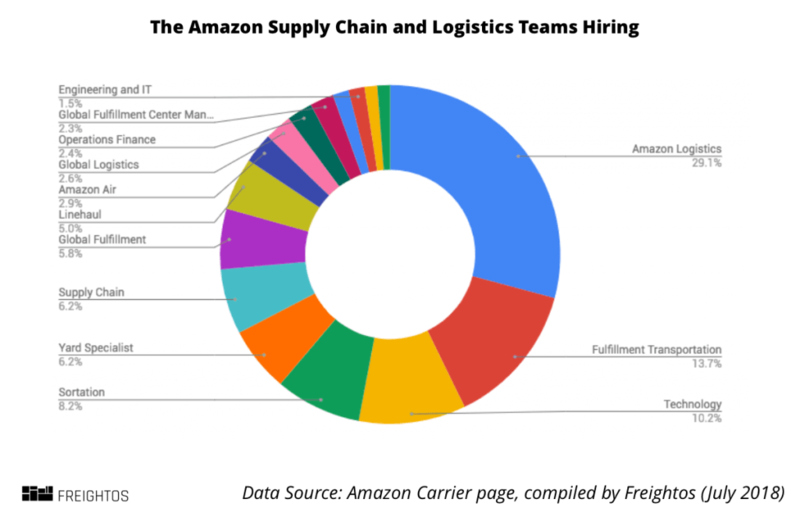 Amazon also operates nine inbound cross dock centers, used to consolidate or break imported shipments and then funnel them to the relevant fulfillment centers. 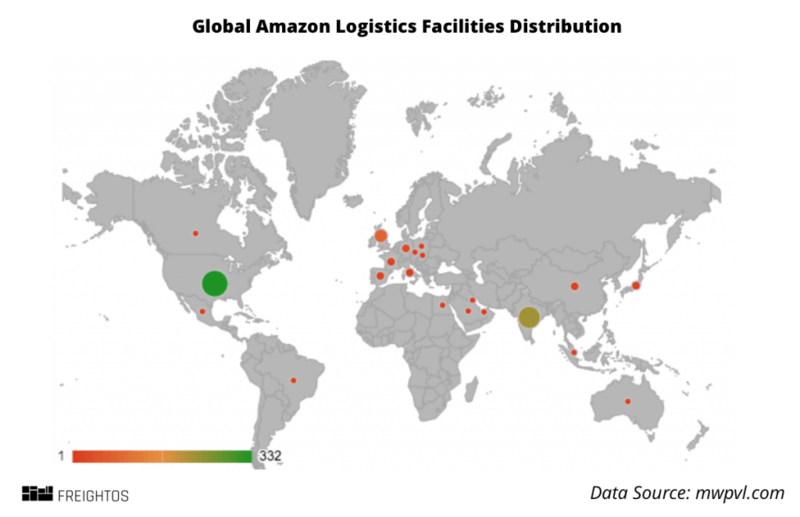 Across twenty additional countries, Amazon’s other centers are predominantly focused on fulfillment and delivery stations while some countries, like Italy, the UK, Germany, France, Spain, Singapore, and Japan also have Prime delivery facilities. Amazon’s trucking fleet is expanding rapidly; it launched in 2005 with the purchase of thousands of trailers used to shift goods between fulfillment centers. While industry chatter claims that Amazon may have as few as 300 actual truck power units, there is talk of aggressive recruitment of fleets with their own power units to move the trailers purchased in the past. 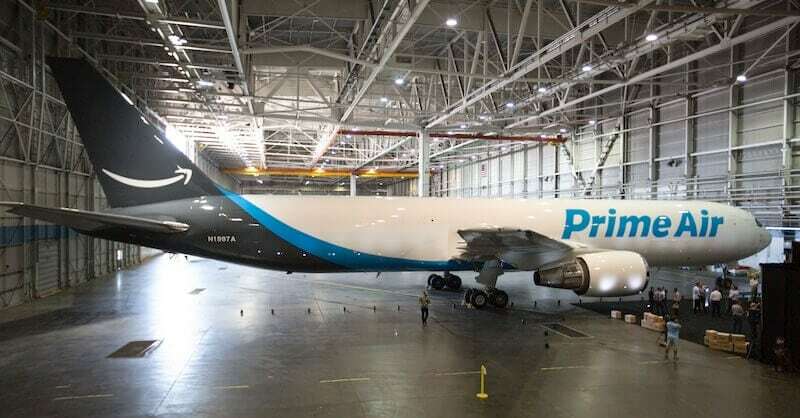 Amazon Air (once called Prime Air) boasts a fleet of 32 Boeing 767-300s, on track to grow to a sizeable 40 aircraft fleet. For context, that’s almost as large as the15th largest US passenger fleet. Not huge, but it’s only going to grow – the planned 210 acre Amazon airport in Kentucky will support up to 200 flights daily. There’s been less progress, though, with ocean freight since Amazon registered as a freight forwarder several years ago. However, that’s not to say Amazon isn’t staffing up; it recently snagged the former CEO of UTi, once a top 20 global freight forwarder, to run their logistics program. And the career data below spells out a strong ocean slant. Most of the attention so far has been on fulfillment. That’s not surprising, given that Amazon’s shipping costs grew from $11.5 billion to $21.7 billion between 2015 and 2017. Last year, fulfillment accounted for 14.2% of net sales, up from 12.5% in 2015. Industry estimates still state that Amazon delivers 5%-10% of their goods themselves, complemented by a range of courier partnerships (perhaps soon to become direct competition) and their now-famous (or infamous) relationship with the USPS. As expected from Amazon, there are other highly innovative (and slightly crazy) ideas in motion too, like crowdsourced deliveries from external contractors (more on Flex’s development below), delivery to car trunks, remote door access to Amazon couriers, Amazon lockers, apartment hubs, and dozens of drone delivery patents. 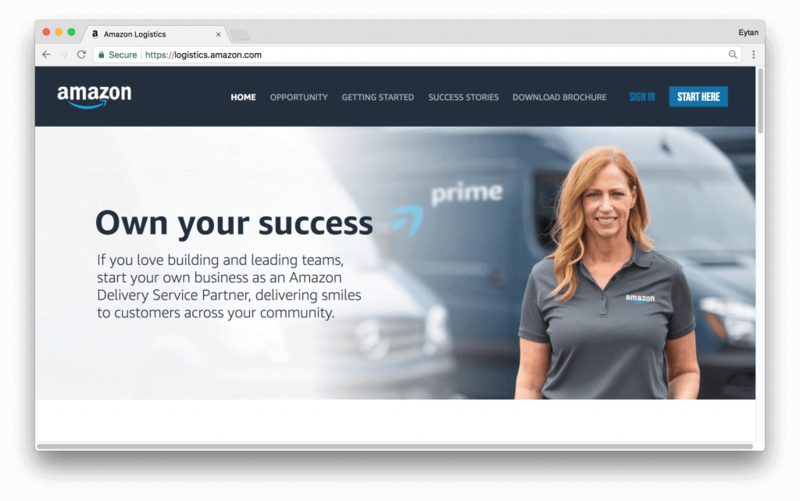 The aforementioned franchise delivery business model recently joined the ranks of Amazon delivery, giving Amazon the ability to grow its own courier network without having to shoulder too much of the financial burden. Amazon has also been rolling out more consumer-facing tracking capabilities, rolling out an app for US customers to track exactly where their package is every step of the way. With such an extensive delivery footprint, it’s no surprise Amazon is contemplating productizing its pickup and delivery service in the shape of Shipping With Amazon, a third-party delivery service. But all of this was already known. Let’s see how Amazon’s logistics plans play out in plain view…on their career site. Amazon currently lists about 17,700 full-time vacancies on its website, with about 920 in the logistics and transportation sector. In other words, about 5% of Amazon jobs are in logistics. Interestingly enough, some past Freightos research found that a similar 5% of jobs at enterprise logistics providers are in the IT sector. About half of these jobs are in the US, and half of these are based out of their Seattle headquarters. But with Amazon’s global footprint, it’s not surprising that they have logistics positions open in 23 countries. The logistics teams hiring most extensively are from the “Amazon Logistics” spectrum (29% of identified teams), followed by Fulfillment (13.75%) and Technology (10.2%). Certainly, a large chunk of these vacancies are shop-floor (5% for their linehaul team, 6% for yard specialists and 8% for sortation); however, many of the positions are anything but. 60% of the advertised senior vacancies require at least four years of experience, with over 10% asking at least seven years. Diving into the senior positions a little further, it becomes clear exactly where the company is moving – cross-border trade and international logistics, while improving courier delivery. The lion’s share of the fourteen jobs requiring over ten years of experience are either technology-related, like a principal machine learning scientist, or deal with international freight, whether it’s a EU Supply Chain Program manager, a senior intermodal manager, or a principal for Amazon Global Logistics’ (AGL) cross-border unit. There are also four non-assistant logistics roles in Amazon’s secretive Lab126, responsible for Amazon’s in-house devices like Kindle and Echo. These positions are focused on operational roles for rapid manufacturing, inventive packaging, and fulfillment. 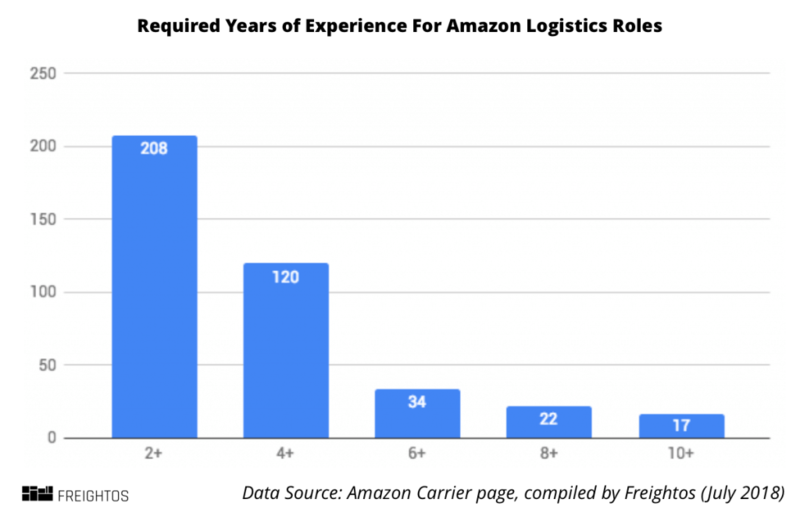 However, logistics positions at Lab126 are far and few between, at just 1% of the open jobs there (compared to a baseline company rate of 5%). There are also a number of positions open on the Flex team, mostly in software and operations roles. The open positions indicate a growing importance in Flex’s deliveries, across both new geographies, larger package sizes, and rush shipments, whether Prime Now or restaurant deliveries. There’s also a growing emphasis on communication for both delivery teams and consumers with Flex, as well as onboarding of new Flex delivery staff, delivery scheduling and more. Air freight figures prominently in job descriptions, with 105 mentioning air shipping. This stands to reason, as Amazon’s air freight business is very much operations-focused – shift manager, area managers, etc. The Senior Manager, Ocean Procurement position focuses on ocean freight procurement, shifting goods to global fulfillment centers on both the import and export side. A key direct relationship with this role is with ocean carriers, and also with third-party vendors. So while the HBS Amazon (His Bezos’ Service) may be further down the line, this senior role, requiring over 10 years of experience and ideally a Masters Degree in Supply Chain, indicates just how important ocean freight is in the long term plan. The Senior Capability Development Manager will own the company’s import strategy. Five years of supply chain product experience and a MBA or Supply Chain Masters, is required. With nearly 1,500 job roles across all departments for the keyword of “import” (8% of the total jobs on the website), 110 for cross-border, and about 70 for cargo or freight, Amazon’s evolution into a comprehensive global supply chain is now an inevitability. Bezos has repeatedly demonstrated that providing a stellar customer experience means taking full control. So where does that leave logistics companies? Few operate at the same scope as Amazon’s level of business. But most do already have expertise, physical networks, and internal technological capabilities to differentiate. Doubling-down on improving user experience had recently become the way to stay ahead. But now, it’s looking like the way not to fall behind. Join over 15,000 who get top-notch logistics tech updates like these directly to their inbox.